Why choose the Italian Lakes for your wedding day? If you’re planning a wedding, and want to make it something a “little bigger” than the typical wedding, Italian Lakes may be the place to go! The quieter shores of Lake Maggiore have a wilder, more majestic beauty. Stresa is one of the most elegant and well-equipped holiday resorts on Lake Maggiore, a town with true Italian atmosphere and charm. Stresa is certainly one of the most romantic little towns on the Italian lakes, a perfect base for discovering some of the most beautiful spots of the Italian lakes. Laga Garda is the largest of the lakes with medieval castles, vineyards and lemon groves surround its banks. The Dolomites to the North, shelter the lake creating a mild climate meaning its ideal for all types of weddings. Lake Garda locations available for weddings include Malcesine and Torri del Benaco. Set entirely within Lombardy, of all the Italian lakes, Como is the most varied. Pretty villages, tiny ports and villas in shady exotic gardens adorn the banks of the lake. Lake Como has three pearls: Varenna, Bellagio and Cernobbio, with its venues as villas and intimate chapels. Lake Iseo is a narrow little lake in Lombardy region between Milano and Brescia and far from massive tourism. You will be enchanted by its little villages and natural views. Little restaurants and lovely hotels on tiny roads of small villages could host your reception overlooking the lake. And for your staying you could spend a relaxing vacation enjoying nature and wonderful walks on lakeside promenade, just a relaxing atmosphere for your party. Last but least Southern Lake Bracciano. It is the only volcanic Lake and it is located close to eternal city of Rome. Lake Bracciano is a romantic and quaint spot of Italy surrounded by forests, olives fields and gardens. Civil or religious ceremony will be wonderful in a little town hall by the shores or in one of the great churches in the area. Country mansions and pretty restaurants by the shores can be the perfect setting for your romantic Italian wedding reception with lots of candles and fairy lights. 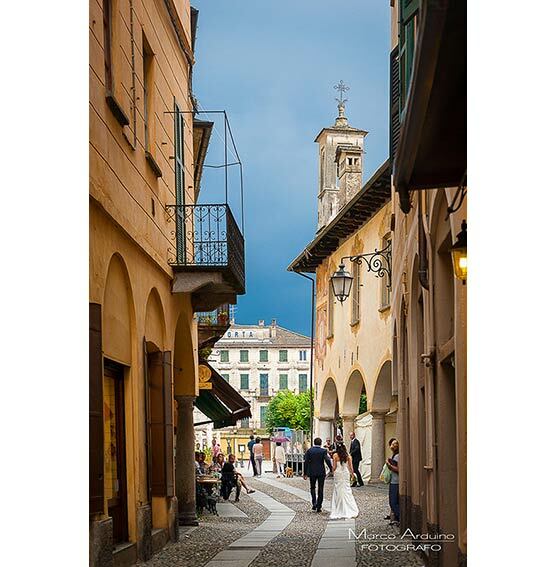 Lake Orta and its St. Julius Island are excellent locations for incredible wedding photographs, and are suitable for weddings all year round: the perfect choice for a perfect destination wedding in Italy. Celebrate your wedding in Lake Orta, which is considered to be the most enchanting and romantic Italian Lake. At only 45 minutes drive from Malpensa Airport, a Lake Orta Wedding is the perfect choice for your fairy-tale wedding in Italy.